Give something in order to get something. People will feel obliged to reciprocate. 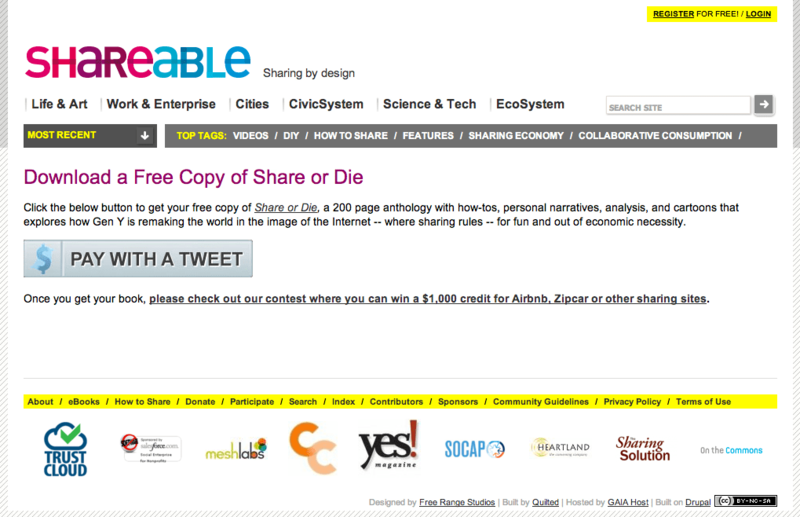 Shareable.com asks for a tweet (reciprocity) in return for downloading their report. In Gluttony we discussed how Foot-In-The-Door and Door-In-The-Face techniques work at least in part through reciprocity. Foot-In-The-Door creates cognitive dissonance in the customer at the thought of refusing to do a larger favor after first doing a smaller one. In Door-In-The-Face the customer makes a reciprocal concession to the smaller second request after denying the large first request. In each case, the customer feels obliged to reciprocate. In fact, reciprocation is a social norm. We also tend to like people who help us, and dislike those who ask for help but don’t return it. There is an implicit obligation to repay someone who does us a favor, whether we asked for the favor or not. Give the gift first, and only then ask for something in return. Typically sites make people register before they can have the “free” report, but this is counter to the principles of reciprocity. The reciprocal favor is often proportional to the perceived value of what you give, so it’s useful to place a value on the item you’re giving them (“Normally $150, but you can download it free today”) so that they feel comparatively generous in return. If time elapses between your gift and your requested response, the recipient will have reduced the value of that gift in their mind. Remind them of the value and prompt them to think about one or two of the benefits that your gift gave them before you ask for the reciprocal favor. Reciprocity doesn’t have to be symmetrical. In other words, the favor can also be paid forwards. For that reason, if you say you have donated to a charity on a customer’s behalf, the customer will feel the same reciprocal pull.